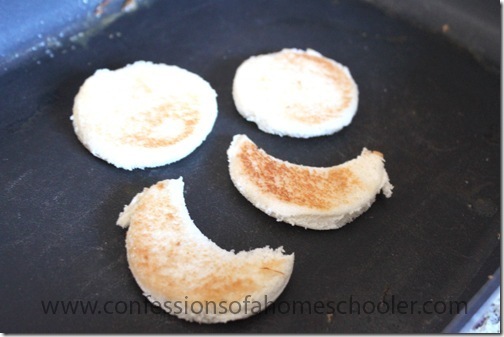 Wondering what to make for breakfast this morning? Kids don’t want cereal again, but you don’t have much time? 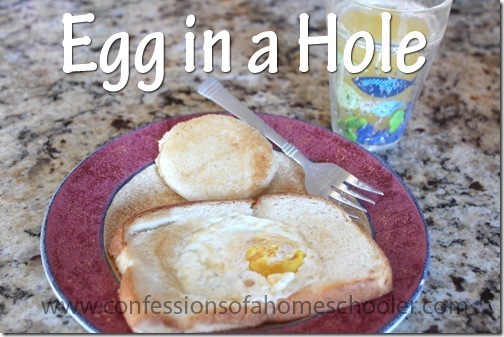 Try Egg in a Hole! It’s super fast, super easy, and only takes eggs, bread, and a little butter! YAY! Melt a few tablespoons of butter in a skillet, or electric skillet on medium heat. Cut a hole out of the center of your bread slices, and set aside. 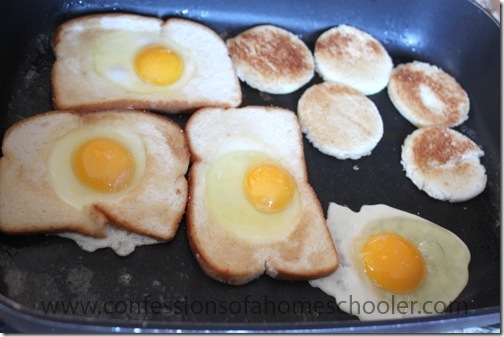 Place the bread into the skillet, then crack open an egg and carefully pour it into the hole in the bread. Cook until browned on one side, then flip and cook the other. You might need to add a little more butter to the pan when you flip it. I usually make one per person, and inevitably I end up making more. But they cook so quickly it’s no biggie. 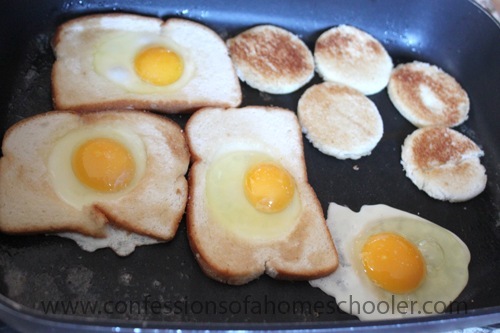 While those are cooking, I also add in the “hole” part of the bread into the pan as well, make sure you get a little melted butter on both sides, and cook both the egg in the hole, and hole until browned on both sides. The hole is my kiddos favorite part. Everyone asks for more holes. 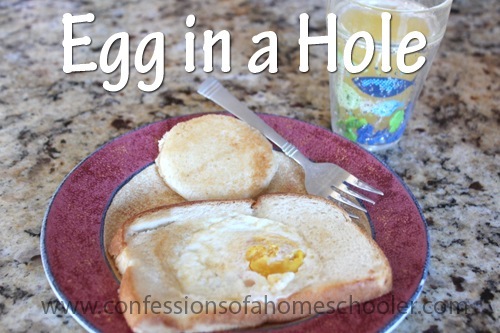 I don’t think they get that it takes an ‘egg in a hole’ to get the hole. So I ended up making one circle, and then also a half moon to get the whole piece of bread used up, no crust. 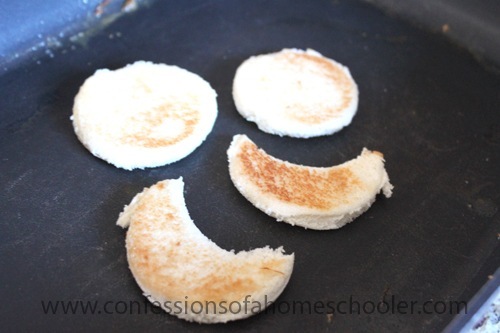 So now we have egg in a hole, plus suns and moons. Anyway, this whole process takes about 10 minutes, which is about the time it takes to get out cereal and milk, and it’s a bit more hearty! We have two names for this breakfast….”T-eggos” and “Hole in One”! We also make mini PB & J’s with the cut out bread. A family favorite! All the credit goes to my hubby for “inventing” this new breakfast! I like this idea. My children really like PB&Js. I learned to do this 20 years ago from my husband’s side of the family. We call them “bird in the hole” or “bird in the nest”. Not only is this great at home but is even better while camping. I think it was originally invented as a means to cook more primitively- toasted bread and cooked eggs in one! This is great. I love the whole “eggs and toast” all cooking at the same time. And I bet putting the egg “inside” the bread makes it easier to flip over than a traditional over easy egg. I always end up using two spatulas to assure I can flip them without breaking the yolks. I love this idea! Btw, where did you purchase your skillet and what size is it? 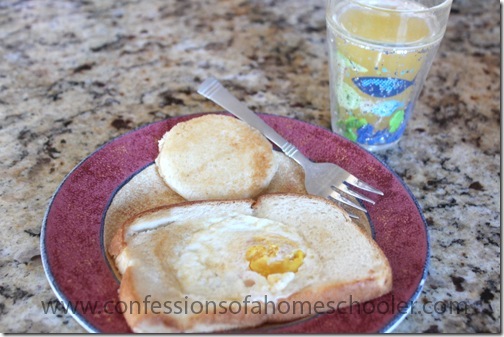 We call those Toad in a Hole at our house, and our kids love them! At my house, we call these “Egg Nests” and they are a family favorite!